Sadly, Rev. Moon is inadequately appreciated for these principles he demonstrated. The Obama administration has pursued a policy of “strategic patience,” synonymous with benign neglect, that has led to an increase in the North’s nuclear arsenal and absence of a diplomatic relationship that had existed modestly even under the preceding Bush administration. The incoming Trump administration might abandon the Obama administration approach towards North Korea and seek a way to irreversibly halt the North’s nuclear and weapons of mass destruction programs. News reports suggest President Obama has conveyed to the President-elect that he considers North Korea the top U.S. foreign policy priority and the White House said it will brief the President-elect’s team in depth on the North Korean issue. A main theme coming from Reverend and Mrs. Moon’s 1991 trip to the DPRK is that issues with North Korea must be resolved not only peacefully but through sincere talks carried out in the spirit of mutual respect. Diplomatic respect is the missing ingredient in the diplomacy conducted by the United States towards North Korea since the early 1990s. As the Summit Council’s Dr. Antonio Betancourt, who met Kim Il Sung five times on behalf of Rev. Moon, phrases it, “You must treat your adversary with the respect and dignity that they may not deserve.” By giving your adversary the dignity and respect you believe they may not deserve, you can then have a partner for negotiations. He adds, “Don’t demonize your enemy because you may destroy the possibility of having a negotiating partner for dialogue and even peace.” North Korea seeks international respect and recognition for its 70 years of achievements and for its intrinsic identity. Rev. Moon deeply understood this character of the North Koreans. An example via the author’s Twitter feed of recent calls for preemptive strikes on North Korea. North Korea maintains it developed nuclear weapons fundamentally for security, unable to trust U.S. intentions, especially after it invaded Iraq unprovoked in 2003. But as a senior DPRK official told a visiting Unificationist leader in 2005, a minimal security guarantee can be achieved by converting an enemy into a friend. The official noted that Russian president Vladimir Putin advised the DPRK leader during his 2002 visit to Vladivostok that “you can be a friend of [President] George W. Bush.” However, the official elaborated, a friendship with the United States can only be initiated at the highest levels of leadership, not the bureaucratic level of government (despite international diplomatic norms). In North Korean political culture, when the necessary trust is established with the paramount leader and he publicly gives his word, he must fulfill his promise since his word signifies the utmost commitment to his people, which he cannot break. This approach, in fact, was partially pursued by President Clinton in his final months in office. In October 2000, North Korea’s Vice Marshal Jo Myong-rok met Clinton in the White House and, in turn, Secretary of State Madeleine Albright met Kim Jong Il in Pyongyang. But because of uncertainty about the winner of the 2000 presidential election and Clinton’s desire to achieve a Middle East peace agreement before leaving office, he did not make a trip to Pyongyang. Since then, senior U.S. officials in recent administrations have come to refer privately to North Korea as the “Norks” and simply maintain “we will not buy the same horse twice” in dealing with them. In contrast, the U.S. President-elect implied he can deal with strong leaders of adversary nations, including Kim Jong Un. Under his administration, if he so chooses, what could occur would be a strategic deal in which the North freezes its nuclear and missile programs while the United States begins negotiations on a peace treaty (including South Korea and China) to formally end the Korean War, and agrees to normalize diplomatic relations. U.S. officials dislike even seriously talking about a peace treaty because, in their view, it is a gimmick for North Korea to obtain international legitimation. Yet, the 1953 Armistice Agreement stipulated that an international high-level political conference would be held three months later to finalize a peace agreement for the Korean Peninsula; the Geneva Conference in May 1954 belatedly attempted to do that, but was unsuccessful. In 1991, Rev. Moon hoped his trip to Pyongyang would soon lead to resolution of the nuclear issue and the first steps toward eventual reunification of the two Koreas. Indeed, incremental progress – however bumpy – did occur. Though the first nuclear crisis reached a peak in June 1994, it was defused when former President Jimmy Carter made a private trip to Pyongyang to meet Kim Il Sung. Carter negotiated a freeze of the North’s nuclear program in exchange for the provision of alternative and proliferation-resistant forms of energy. The Clinton administration then undertook months of detailed negotiations with the North Koreans to finalize the deal and concluded the October 1994 Agreed Framework that froze the North’s plutonium program. In July 1994, Kim Il Sung unexpectedly died, leaving his son, Kim Jong Il, as successor. Kim’s passing was unfortunate given he had committed to Carter to hold a summit meeting with South Korean President Kim Young Sam later that summer. But more unfortunate was the South Korean leader chose not to issue even pro forma condolences upon his North Korean counterpart’s death (much less attend or send representatives to the state funeral), and instead allowed his government to brand Kim Il Sung a war criminal. What had been a major window of opportunity quickly disintegrated into seriously damaged inter-Korean relations that lasted through the end of the decade. The first inter-Korean summit occurred in June 2000 between Kim Jong Il and ROK President Kim Dae Jung, but that historic meeting was overshadowed when the George W. Bush administration came to office, which sought to distance itself from the policies of the Clinton administration. The U.S. effectively terminated the Agreed Framework with the DPRK by October 2002, alleging cheating; yet these issues could have been resolved quietly without unilateral abrogation of the agreement. With the demise of the Agreed Framework, the North’s first test of a nuclear device in 2006, and subsequent launches of dozens of intermediate and long-range missiles, the Clinton administration’s modest achievements were erased. Upon the death of Kim Jong Il in 2011, North Korea became preoccupied with sheer survival and third generation leadership succession to the considerably younger Kim Jong Un, grandson of Kim Il Sung. 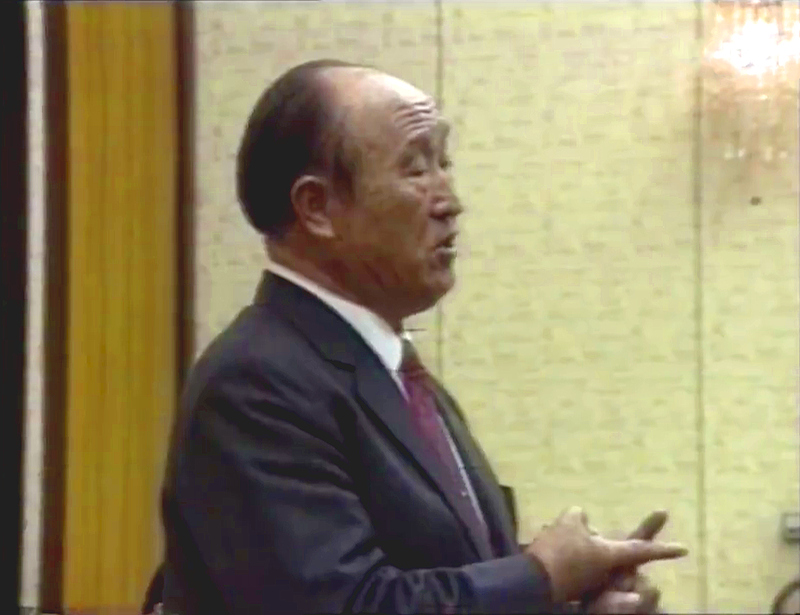 A video screenshot of Reverend Moon addressing senior DPRK officials at Mansudae Assembly Hall, the national parliament building, on Dec. 2, 1991. Had the ROK government seen Rev. Moon’s initiative toward the DPRK in 1991 as something it could work with — an initiative that had a profound impact on inter-Korean relations with the signing of the Basic Agreement on Reconciliation, Non-aggression and Exchanges and Cooperation on Dec. 13, 1991 — prospects for peace on the Korean peninsula would have been much more promising. The window of opportunity open in 1992-94 did not return. While new opportunities may arise, experts contend too much has changed to expect the North Korean issue can be dealt with as in the early 1990s. Rev. Moon passed away in 2012 and never made a second visit to Pyongyang. However, his widow, Mrs. Hak Ja Han Moon, may have such an opportunity at the right time. From 2013, modest efforts to explore Korean peninsula issues as part of larger fora were undertaken by a few Unification movement entities, bringing several well-known speakers. But most helpful now would be for the Unification movement to encourage a multinational effort, with particular involvement of Americans, to address the sorry state of inter-Korean relations and the tensions inflicted upon the international system by North Korea. Given Mrs. Moon’s revival of the International Conference on the Unity of the Sciences, and creation of the International Association of Parliamentarians for Peace, perhaps a major effort to improve inter-Korean relations will soon emerge. The policies of South Korea, the United States, Japan, and even Russia and China all need to be addressed. However, South Korean President Park Geun-hye was impeached on Dec. 9, and she awaits the decision of Seoul’s top court to uphold the impeachment, which could take up to six months. In the meantime, her presidential powers are suspended and her prime minister became acting president. If the impeachment sticks — or if she resigns first — new presidential elections must be held within 60 days. Also, one day after his election victory, Park called President-elect Trump to reaffirm the mutual U.S.-ROK alliance. To follow Rev. Moon’s principles by which he met President Kim Il Sung 25 years ago implies not merely emulating the work of other organizations but demonstrating a new and innovative approach that others either fail to realize or are afraid to undertake. Such an effort by the Unification movement may require substantial — but not exorbitant – resources, as well as the imagination and willingness to pierce through the intransigence which has kept peace from Korea since 1953. Rev. Moon’s approaches to Kim Il Sung — as well as Soviet President Gorbachev — fly in the face of the predominant conduct of international relations by the major powers, particularly since the new millennium. Rev. and Mrs. Moon stand for genuine principles of peace, respect and reconciliation, while some of the major powers in Northeast Asia have over-demonstrated the use of force rather than reliance on diplomacy as the first resort. 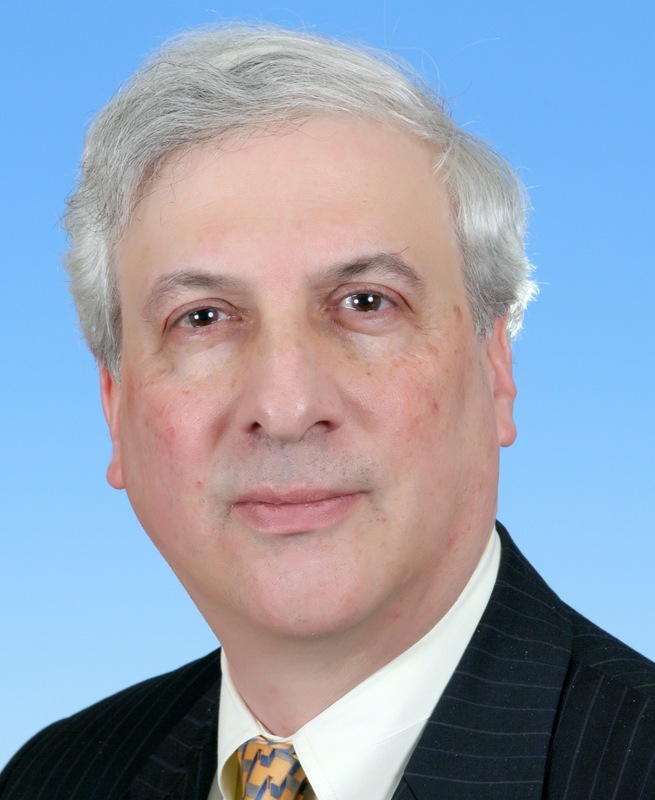 Dr. Mark P. Barry is Managing Editor of the Applied Unificationism blog, Lecturer in Management at UTS, and Associate Editor of the International Journal on World Peace. He met the late President Kim Il Sung with the Summit Council for World Peace in 1994. Follow his Korean affairs Twitter feed @DrMarkPBarry. Photo at top: Reverend and Mrs. 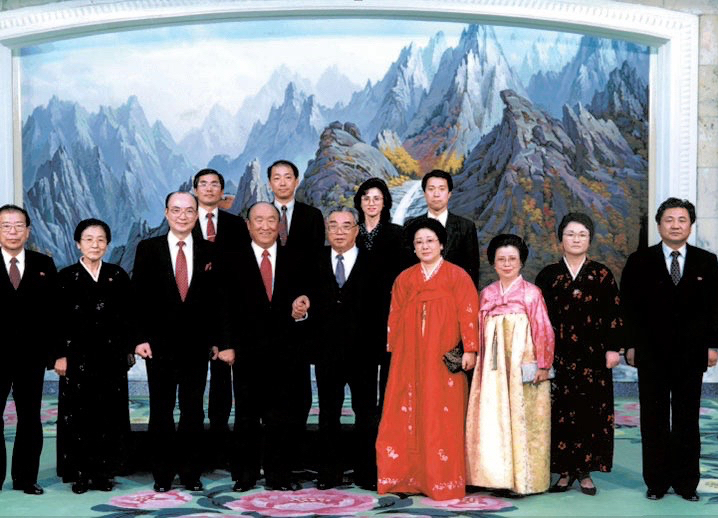 Moon met President Kim Il Sung (c.), joined by Dr. and Mrs. Bo Hi Pak (then-Chairman, Segye Ilbo), their entourage, and senior DPRK officials, in Hamhung City on Dec. 6, 1991. Thank you, Dr. Barry, for this balanced and insightful commentary. It seems obvious that a new approach to the North Korean issue is needed. It was in 1991, during a small meeting in Korea, when Rev. Moon stated that he considered the reunification of the two Koreas his personal responsibility and that he wanted to accomplish this task by 2000. Unfortunately, his ardent wish was not fulfilled. Regarding today’s role of the Unification Movement in the unification process I believe the most essential condition is for the various factions in the movement to come together and work together on this challenging task. This would serve the actual process of reunification and the Unification Movement as well. If anything, the relationship between North Korea and America and the West has gotten far worse in the last 25 years. Two absolute dictators later, North Korea has nuclear weapons and a full-blown missile program, plus the usual array of conventional weapons that could obliterate Seoul in a matter of minutes. The North is far more threatening than before. As for the author’s suggestion of “an opportunity for permanent peace on the Korean peninsula” by 2020, just how does he see that taking place? Is Trump the president to institute such a sea change, or is another geopolitical mechanism involved? Without such speculation, then the author’s conclusion appears mere guesswork. Well said. A very important article. I hope it can be reproduced in other media outlets to gain a wide audience. If one really appreciates the heart that TF had to muster for this meeting, they could truly understand TF. He prayed for several days, because of the resentment he had for this man. Truly, he came to love him like a brother, but with a parent’s heart. If Kim had sensed any insincerity, I doubt it would have gone as it did. As TF has stipulated: the mission of Abel is to give Satan all the love he was entitled to but never received. On that foundation Satan must surrender. If Kim had lived longer, the true fruits of that meeting with TF might have yielded a different history. But TF set the standard. I think that this article should be published as an op-ed in major newspapers — at the very least, in The Washington Times. Its content is too valuable to not go beyond our Unificationist community. Please seriously consider submitting it to the wider media. At the very least, readers can share this article on Facebook and other social media. As we learned in the recent presidential election, social media can be more powerful than the mass media. Update: The FFWPU-USA website has now linked to this article, making it visible to a much larger audience. Excellent words. I always remember the visit of President Nixon to China in 1972, well-prepared by Henry Kissinger. He was the first president to do that, understanding the importance of that part of the world and to open it for dialogue. Mao Zedong was a mass murderer and yet received the respect he did not deserve. Nowadays, U.S. policy demonizes those leaders it does not like and supports rebel groups in an effort to topple those governments. I pray that Trump will use a different strategy. Thanks for reminding us about Rev. Moon’s historic trip to North Korea. Together with is wife, Dr. Hak Ja Han, and Dr. and Mrs. Bo Hi Pak, and entourage, they reached Pyongyang, and were never sure if they could return to the South. They really put their life in God’s hands — and in Kim Il Sung’s hands. Their achievement between November 30 and December 6, 1991 will be registered in the book of history. One of my primary concerns resulting from the establishment of the Sanctuary Church is that the process with North Korea initiated by Rev. Moon in 1991 is not being followed up, despite the opportunity that Hyung Jin Moon’s visits to N. Korea prior to and at the time of his father’s passing might have created. Rev. Moon’s visit was followed up by such as Dr. Bo Hi Pak, who went to Pyongyang to celebrate the fifth anniversary of the famous meeting together with Kim Jong Il in December 1995, having been invited by the “Dear Leader.” The Little Angels performed in Pyongyang in 1998. A hotel was acquired, the Pyeonghwa Motors car factory started (then given to N. Korea after Rev. Moon’s death), a World Peace Center built in Pyongyang. Even in the build-up to the Peace Cup in Spain in 2009, a very late approach was made by N. Korea suggesting one of its clubs be included! However as the author rightly points out, in such a society as North Korea there needs to be a real relationship with the “paramount leader” for there to be the hope of substantial change. Seeing Hyung Jin Moon accepting N. Korea’s most prestigious National Reunification Prize (Sept. 5, 2012) on his father’s behalf probably had many Unificationists licking their providential lips thinking of the possible future relationship between Hyung Jin Moon and the somewhat younger Kim Jong Un and the doors that could open. Hopefully that chapter of restorational history is waiting to be written, but I, for one, am not holding my breath. Interesting perspective; highly unlikely successful approach in my opinion, however. As for the author’s suggestion of “follow(ing) Rev. Moon’s principles by which he met President Kim Il Sung 25 years ago and demonstrating a new and innovative approach,” it would seem to be too late for that. We are dealing with an evil family/dynasty — it must be rooted out, utterly. In 1972, Rev. Moon predicted the rise and fall of communism according to a 70-year time period. Later, he repeated his prophetic declaration to gatherings of scholars and eminent scientists. Many considered the prediction at the height of the Cold War to be foolishness. Yet, the prediction held true as the Soviet Union collapsed in 1991, following the crumbling of the Berlin Wall in 1989 — roughly 70 years after the Russian Revolution in 1917. This prediction can be put to the test again. Communist China will reach the age of 70 in 2019. And, North Korea will reach the age of 70 in the year 2018. In the next few years, by 2020, there may be an opportunity for peace and reconciliation on the Korean peninsula, putting to rest over seven decades of division and war. There are lessons to be learned; but, to achieve that we need to appreciate the historical teachings and circumstantial foresight of Rev. Moon from years ago.